The fate of millions of people across the country remains in limbo. 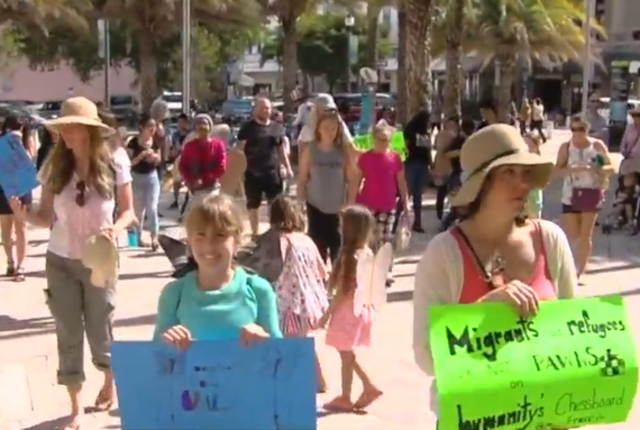 The Dream Act, which would grant legal status to young immigrant children, is still being debated in Washington, D.C.
Several groups including Women's March Florida, Charge Forward and Florida Student Power organized the rally around Friday's "Take You Child To Work Day" for Palm Beach County. "We decided that for take your child to work day we wanted to highlight the youth voices in Palm Beach County," said Meagan Bell with Charge Forward Palm Beach County. When it comes to immigration reform, a “Dreamer” refers to a young person who qualifies for the Development, Relief, and Education for Alien Minors (DREAM) Act. Dreamers are also frequently referred to as DACA recipients. Right now, Congress is debating President Donald Trump's offer to almost two million of undocumented immigrants of a path to citizenship, in exchange for millions of dollars to build a border wall and new curbs on legal immigration including DACA. "These are people whose lives are affected. We can't just say, 'oh well protect half of them, but not the other half. 'ffff That's throwing thousands of people back into darkness basically," said Bell, who is a child of immigrants and is married to an immigrant from Sweden. "We're all immigrants, and we have to watch out for each other and protect each other." Julia Montejo grew up in Jupiter, the daughter of immigrants from Guatemala. "I really felt like school was where I felt really supported but one of the really hard things was that I never really talked about my status -- because I felt like people would judge me," she said. "As I got older, there were a lot more barriers with different things like getting a drivers license or a state ID, or being able to go to college." She said when DACA was announced during the Obama administration, she felt a huge sigh of relief. "I remember watching CSPAN, when the previous iterations of the Dream Act had been voted on. And I saw those votes go down," she said. "It really empowered me to not only pursue my education but to really be courageous in standing up not only for myself but the entire immigrant community." However, like many other DACA recipients, she worries about the future. "I have a citizen brother, and many dreamers have citizen children. And separating our families, grandkids from grandparents, or siblings from a parent just to save another sibling, is unjustified and inhumane," she said. Anne Pierre is from Haiti and has lived here for 30 years. "Please again, Mr. Trump, have a heart. Feel it," she said during a speech at the rally. She says her daughter fears losing her best friends. "I'm helpless. There's nothing I can do right now but to come. And make my voice heard," she said. After the rally, families marched to Senator Bill Nelson's office in the Mandel Public Library to meet with his staff. Senator Nelson was not in his office but families said their message will be brought to him directly by his staff. "I would like to see more current from Democrats, especially senators like our own Senator Bill Nelson, I would love to see courage to actually stand behind immigrant communities," said Montejo. President Trump said this week that if Democrats reject his proposal, the White House won't approve it, adding, "They'll either have something that's fair and equitable or we're going to have nothing at all."